Unlike with traditional business brokers, ASG Partners maximizes the seller’s benefit by engaging multiple prospective buyers while maintaining confidentiality, minimizing risks and protecting the interests of all parties involved. Our 7-step process for selling a business has been refined over many years and hundreds of successful transactions. Our process for selling a business begins with a thorough understanding your objectives. A successful sale involves much more than just getting the best price for your company – it’s also about getting the right payment terms, the correct tax structure, and a buyer with an operating philosophy you respect. The ASG Process not only maximizes value, but protects you from litigation risk, ensures the confidentiality of the sale of your company, and minimizes the time and energy you put into the sale. We focus on the transaction process so that you can remain focused on running the company. Most importantly, we conduct the entire selling process under the umbrella of confidentiality. Our clients’ businesses may be at risk if customers, suppliers or employees become aware that their companies may be for sale. Everything we do, right up to the day your transaction closes, is done with the strictest attention to confidentiality. Decades of experience have given us an unsurpassed understanding of what is important to business owners—through the entire experience of selling a business. 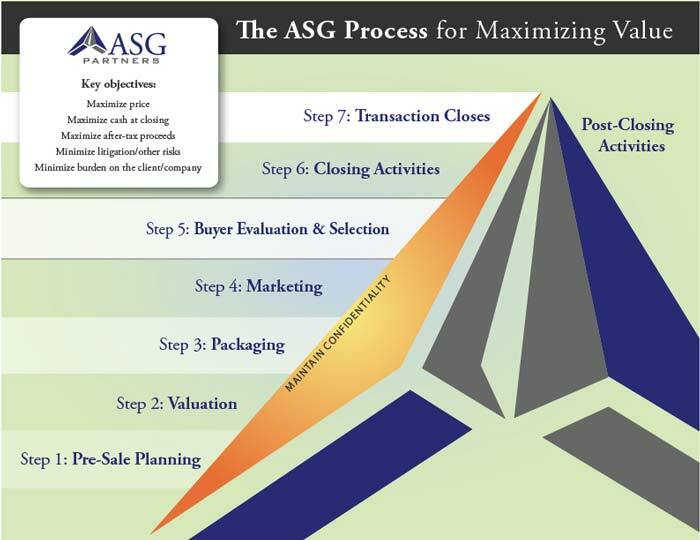 Get in touch today to learn more about ASG’s Process for finding buyers.